Roksan launches Radius 7 'The Pink' charity turntable | What Hi-Fi? Roksan will donate a percentage of sales from this eye-catching pink Radius 7 record player to Breast Cancer Care. 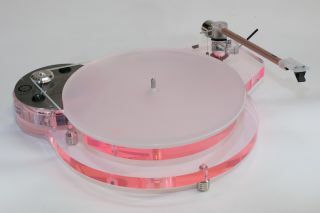 'The Pink' is a special version of the Roksan Radius 7 turntable. First seen at the National Audio Show earlier this year, Roksan has applied a pink tint to the glass-effect plinth, and a rosy finish to the Nima tonearm. And it certainly stands out from the crowd. Put aside the cosmetic changes, and 'The Pink' is exactly the same player as the standard Radius 7. It still has the dual-layer Perspex plinth, and a drive motor taken from the company's flagship Xerxes turntable. The turntable is supplied with a Nima uni-pivot tonearm, which has the same circuit board cable as the company's top-of-the-range Artemiz arm. And it will play 33 and 45rpm records, with a switch to change rotation speeds. The pink Radius 7 is available for £2,050 now (or you can just donate to the Breast Cancer Care here).